BLUEGRASS TODAY calls Alan Tompkins “a true Renaissance man,” and the title certainly fits. 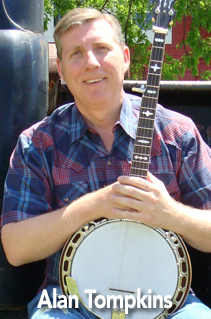 A native of the farming and coal mining country of western Kentucky, Alan grew up steeped in the sounds of classic country, gospel, and bluegrass music. He performed in several bands in his home town of Madisonville, Kentucky before moving to Texas in 1983, where he earned MBA and law degrees at SMU. It was a thrill for Alan to produce and record his first album, No Part of Nothin’ , released in 2012. The album features a lineup of incredibly talented musicians and singers, many of whom are Grammy® or IBMA award winners or nominees. The list includes Sam Bush, Deryl Dodd, Kenny & Amanda Smith, Ron Stewart, Stephen Mougin, Gerald Jones, Greg Cahill, Ned Luberecki, Mike Bub, Randy Kohrs, Brad Davis, Nate Lee, Bobby Davis, and Steve Rhian. Alan is the founder and President of the Bluegrass Heritage Foundation, a non-profit organization dedicated to the promotion of bluegrass music in America. The Foundation produced Fanning the Fire, an award-winning short film about bluegrass music that screened in more than 25 film festivals across the United States, in 2011. He’s a 2009 graduate of the IBMA Leadership Bluegrass program and presently serves as the chair of the planning committee for the program. Alan plays a Huber Banjo, some great, really old Gibson banjos, a 1961 Kay bass, a New Standard Cleveland bass, Beard dobros, and few other great instruments.